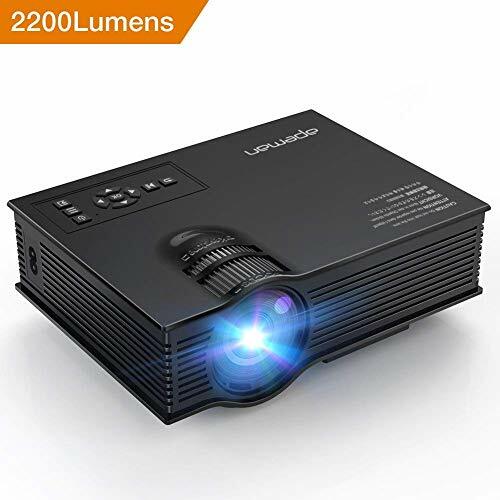 Advanced LED technology: we adopt the latest upgraded LED technology, providing more brightness than ordinary LED projector, enabling you to enjoy crystal clear image in dark room. 1. Due to the copyright issue of Dolby, this projector does not support Dolby's Audio decoding (close the Dolby option of the device), or you might not get sound from videos, especially when you watch Netflix. 2. To connect with PC/laptop, please adjust the PC/laptop display resolution to 800*600 or 1024*768. 3. Please note that it only provides clear image in dark room. 4. When powered on and continuously working every 3-4 hours, the fan will work to cool down the machine (you are recommended to take a break after 3-4 hours' using to avoid overheating). Treating it good will extend its life.